and Sunday, March 3 at 2:00 p.m.
- This production is not recommended for children under 13 years old due to mature themes and content. - Please, no babes in arms. - Running time is 2.5 hours including an intermission. 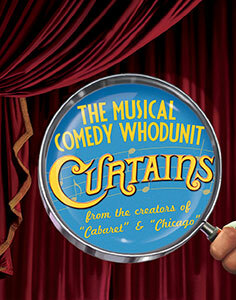 Curtains is presented through special arrangement with Theatrical Rights Worldwide (TRW). All authorized performance materials are also supplied by TRW. Reserved Tickets are strongly recommended: Seating for Lynchburg College Theatre productions are sometimes limited. Tickets not picked up may be released. Reserved tickets should be picked up at least 10 minutes prior to the show. Please arrive on time: Latecomers will be seated, at a suitable pause in the performance, in the nearest seat available.